Gibraltar is a great place to eat and drink and generally enjoy the sunshine and outdoors Mediterranean lifestyle. Al fresco dining is the name of the game in Gibraltar and whether you want traditional English grub (of which there is plenty), Indian, Spanish, French, Moroccan, Chinese, Italian or just about any other type of dining - you will find it here in one of Gibraltar's many fine eating establishments. 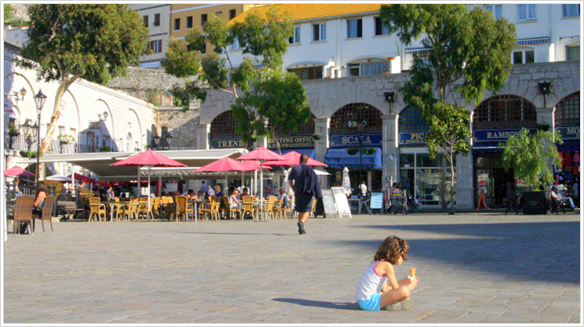 Casemates Square has a chequered past as it was formerly the site of public executions in Gibraltar. Nowadays, however, it is at the centre of Gibraltarian life and is the place to head to for trendy cafe's, restaurants and bars as well as for the Tourist Information Centre and boutique shops or just have an ice cream and relax. With Gibraltar’s only Burger King and Pizza Hut to name a few. Take a seat at one of the Square’s many tables, order a drink and watch the world go by.